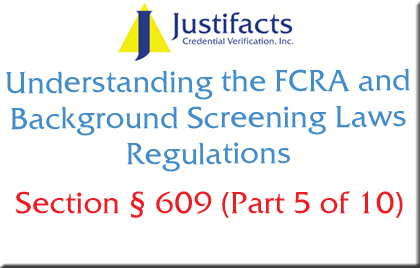 Section 609 details what information must be disclosed to an applicant if he/she requests it. 2. The sources of information; except that the sources of information acquired solely for use in preparing an investigative consumer report and actually use for no other purpose need not be disclosed. However, in the event of a lawsuit, the sources must be made available to the plaintiff under appropriate discovery procedures in the court in which the action is brought. 3. Identification of each person that procured a background check for employment purposes, during the 2-year period preceding the date on which the request is made. 4. A statement that a CRA is not required to remove accurate, derogatory information from the file of an applicant unless the information is outdated under section 605 (Part 2 of our series) or cannot be verified. In the event that applicants requests to see their background check, they have a right to see, with some exceptions, all the information in their file. Applicants also have a right to know who and why the information was requested on them. Furthermore, applicants must be provided with a summary of their rights, under the FCRA, during the application process.